The buzz and hype around a team advancing in the tournament can be a huge boost to a school’s Facebook engagement. Now of course likes don’t equal buckets, and fans aren’t playing defense… but what if the games were determined by this interaction? 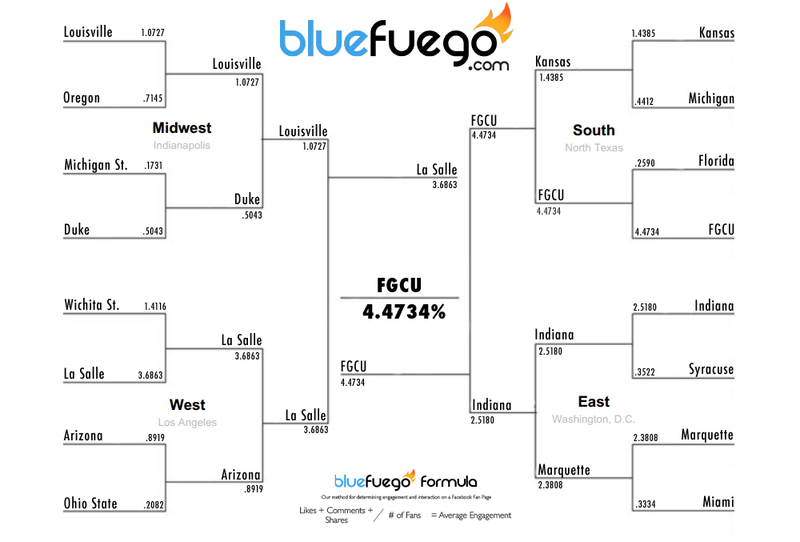 Joe took a fun look at the Sweet 16 bracket, determining the winner of each game based on the BlueFuego Formula for posts in March. La Salle and FGCU benefitted enough from the hype to take them all the way to the championship game with FGCU pulling out a 4.47% to 3.68% win. Wichita State should have followed suit… but going against all logic they have posted 141 times in March. Missed opportunity to post meaningful, interesting content. Largest flagship schools are hardly making a sound with their fan base, likely due to so many fans existing for content other than basketball on the page. Michigan St. and Ohio St. rank at the bottom.